Stanninghall is a lost little hamlet, along a narrow winding back lane between Frettenham and the Horstead road. There's a farm, a few modern cottages around what must have been a village green once, and the stump of a ruined church tower above it all. 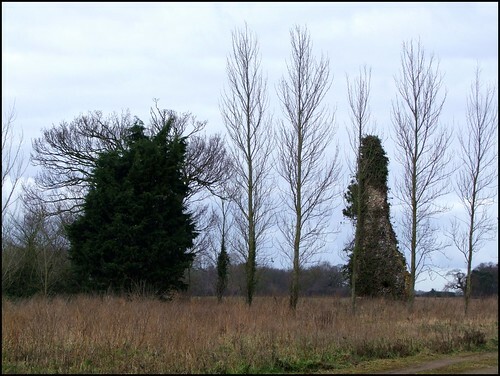 Norfolk has more ruined churches than any other county in England - there are remains of more than a hundred, and the former sites of many more. There are a variety of reasons why churches fall into disuse and decay, and much can be deduced from knowing the date at which a church was last used. St Peter was a reasonably well-endowed building in medieval times, but we know that by 1602 it had fallen into disuse. The immediate conclusion to leap to is that it was no longer required after the Protestant Reformation, and this is undoubtedly true; but the real reasons here are rather more complex. In modern parlance, it might be said that Stanninghall church suffered a triple whammy. Firstly, the general depopulation of Norfolk after the epidemics of the 14th Century resulted in a boom in the economy. Old, stifling patterns of land ownership had been broken, the wages rose, the demand for goods increased, and East Anglia saw the rise of the new entrepreneurs, who, although not from noble backgrounds, would rapidly rise to the top of the pile by their sheer energy in trade and acquisition of land. They came, quite literally, to seek their fortune. In East Anglia, the most famous of these people were the de la Poles, a family of Hull merchants who had become the most powerful in East Anglia by the end of the Middle Ages. But there were many other businessmen who seized their opportunities as the old estates were broken up. East Anglia would become the industrial heartland of England in the late Middle Ages, and this boom would be fuelled by a commodity which produced a high return for low labour costs: sheep. But sheep need land, and as the new businessmen expanded their empires, buying up plots and putting them together in larger and ever larger estates, they drove all other forms of agriculture from the land. This was only the first of the factors which led to the parish of Stanninghall emptying. The second is that the parish lies not far from the edge of what was, by 1450, the second largest city in England. If there were no employment opportunities in Stanninghall, then there certainly were in Norwich. It is no coincidence that the great majority of Norfolk's ruined churches lie not far from the edge of what were the larger medieval towns. There was a third factor here. The man who came to own the greater part of the acreage of Stanninghall was a Catholic. Clinging to England's old religion, he had no desire to help what was effectively the local arm of state government to prosper, and consequently he failed to provide for the material or spiritual upkeep of the newly protestant parish church. Instead, 17th Century Stanninghall's faithful Anglicans were directed west to Frettenham, and the two parishes were combined. A surprising amount of St Peter survives, but it is on private land. A large sign on the back lane which runs down from the Horstead road leaves you in no doubt about this. But there is plenty to be seen from the road: about two thirds of the tower are still in place. Bill Wilson in the revised Pevsner claims to have seen the north and south walls of the nave in the late 1990s, but these are not apparent today. What is left appears to be reasonably well-maintained, and is a pleasing touchstone back down the long Stanninghall generations.